Today is the feast day of King Wenceslaus, Duke of Bohemia from 924-929. This is the Good King Wenceslaus from the Christmas Carol! James Melzer via Flickr, licensed cc. When a poor man came in sight, gathering winter fuel"
here, and a great article at Catholic culture. Lest we forget, today is a good day to sing this hymn! When you think YOUR family is bad, you can always remember King Wenceslaus and then count your blessings. Wenceslaus was the product of a mixed marriage - his mother, Drahomira, being a Pagan convert to Christianity. After his father's death, Drahomira became the regent and greatly enjoyed her position, especially the part about persecuting Christians. 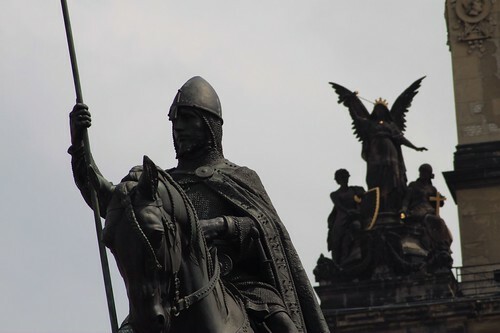 Wenceslaus was raised in the faith by his devoted grandmother Ludmilla, and when he became 18, Wenceslaus took over his kingdom and stopped the official persecution of Christian, although the bloodshed continued. In the end, Drahmira had Ludmilla murdered, and shortly thereafter Wenceslaus was attacked and killed by his brother while he was on the way to mass. This was the epitome of family dysfunction. Christmas sheet music to download and play.